Yesterday near sunset, we discovered that a huge limb had come down from the huge Sweetgum in our volcano strip and lying onto the sidewalk. It was blocking anyone wanting to pass. I mean, this puppy was huge. We called the city and got an emergency person out to take are of it since it was a hazard. Gratefully, it only took about an hour for someone to come out. This is good, since we have an 83 year old neighbor, who would have had to go out into the street to get to the mailbox. Not good. We have had the city trim back this limb before, since it usually drooped over the sidewalk and almost down to the ground in our yard. Well, I knew that we would have to do it again since the bhranches had become very long since last year. But now we don’t have to worry about it, since it is gone. What I was not ready for was the complete loss of a whole section of my front shade garden. Right there in the shadiest part of my front yard was a huge gaping hole in the shade with glaring, beating sun at 4pm in 90 degree weather on plants that weren’t used to this kind of light Or heat. Yikes! What’s a plant to do? The answer is adapt…I hope! Just take a look at what I saw. Our front yard had some nice shade in the area around the rocks near the tree. You can sort of see this here, although I think this may have been a somewhat overcast day. Now look how much sun I am getting here after the limb fell down. I have almost all shade plants there except for the irises, which have not bloomed as well in shade. It’s getting to 100 this week. We will see if they survive. Yup! You can see really well whee they had to saw off the tree limb. I will have to call for their regular crew to do a cleaner job, since this was the emergency crew with a not so good saw and no ladder. But at leasI, that tree limb is off the sidewalk. See what a huge gap that made in the canopy? All of that blue sky you see had a nice tree limb covering it before. I really do hope my shade plants wont fry. 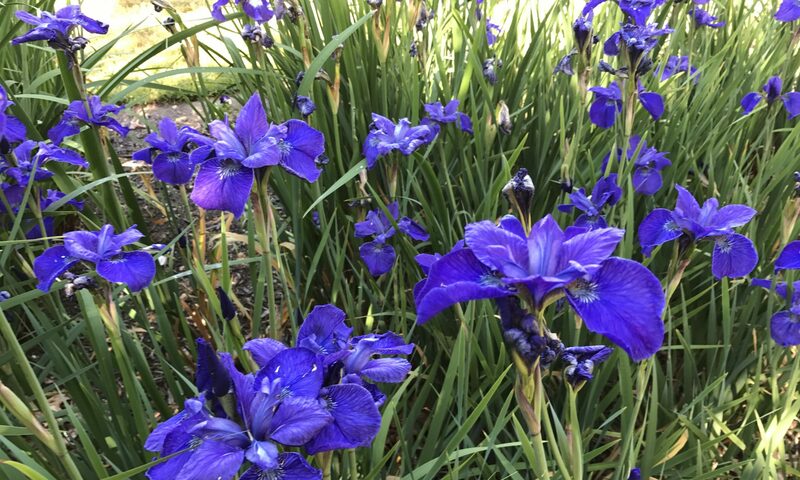 On the other hand, my irises will love it. And there are new opportunities for other sun plants….not that I need more sun plants. Like this beautiful Peach Daylily. Or a bright red Geum. Or maybe even another Peony opportunity. Hopefully, my shade plants will do OK, but if not, there are pretty sun plants. I’m really not whining, but I would love some of that good Oregon Wine. That is quite a story, I would never have thought the effect a downed tree would have on the garden regarding shade, but now the light has gone off over my head. I hope your shade plants survive. Great photos and I thank you so much for linking with Today’s Flowers. Thanks and thanks for coming by. We will see if my shade plants can take it. Gardeni ng is always an adventure.